In Silesia, back in 1929, Carl Rotter patented his spherical-drilling technique. In his father’s company the demand was for traditional cuts and designs. 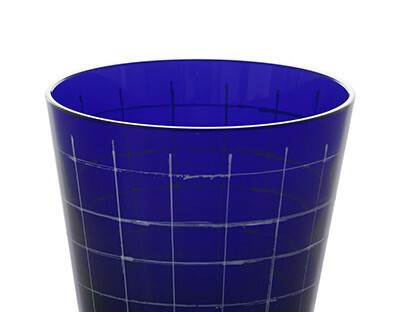 It was in Lübeck, after World War II in 1948, that Carl Rotter transformed a cloudy press glass tumbler by implementing his patented technique. 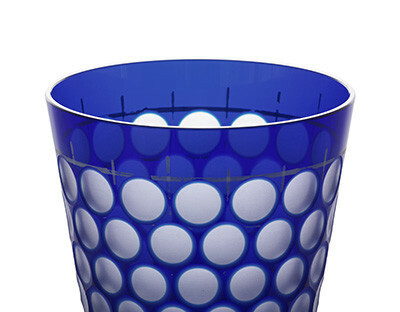 The opaque glass became shiny: The Kugelbecher was born. Numerous other engraving techniques were developed and new cuts created. Carl Rotter brought his handicraft with him from Silesia, where he was born on October 22, 1895. There, his father Franz Rotter ran a respectable glass cutting workshop - the people called it “Rotter Schleife” - with 40 craftsmen. After having completed his vocational training, he worked eagerly on a technique to cut spheric shapes deeper into the glass. He called it “spherical-drilling technique”, and, in 1929, the patent office in Berlin confirmed the novelty of his technique. He met his wife in the same year and married her the following year; in 1932, their son Wolfgang was born. After World War II, they settled down in Lübeck, and opened their workshop in 1948. 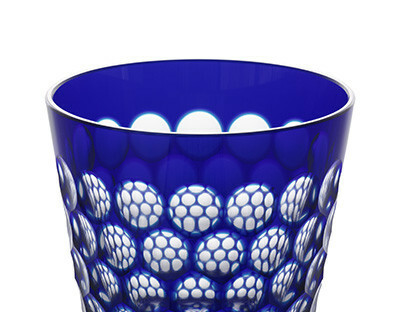 At first, Carl Rotter used pressed glass, due to the lack of high-quality glass after the war. 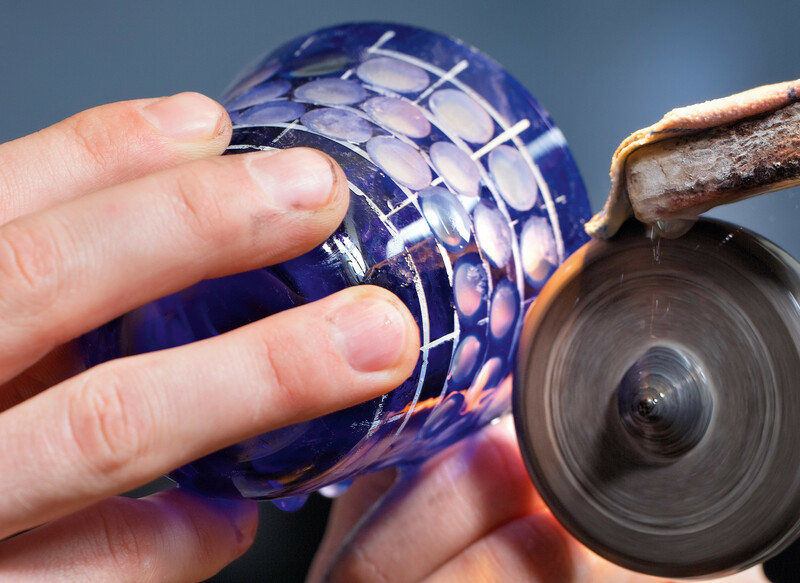 With his spheric-drilling technique, he cut the whole surface of the glass and polished every spheric shape by hand - making the “opaque” glass shiny and clear. Every spheric shape works as a kaleidoscope - a fascinating effect. This is how Rotter’s Kugelbecher, which is known far beyond Lübeck’s borders, was created. Today, it is still cut with this traditional technique. In 1968, after Carl's death, his wife Margarete continued the tradition. Later, his son Wolfgang took over the company. Wolfgang Rotter passed on the management to his wife Birgit Rotter in 2013. With a permanent marker evenly distributed horizontal and vertical lines are drawn on the object depending on the design to be cut. With silicon carbide grinding wheels (SiC), the coated glass is roughly grinded until the various profiles, contours and depths are achieved and the colour layer is removed. A corundum wheel (AL203) finely smooths the milky areas resulting in a satin-polish. This prepares the piece for the final production step. The shiny lustre is achieved by buffing and polishing with cork or felt wheels and pumice-powder. 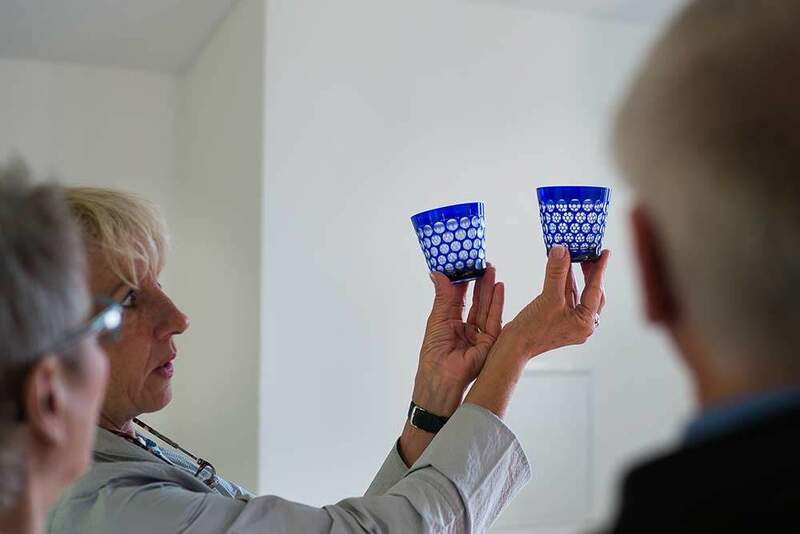 Dexterity, precision and sensitivity are essential, as at this point the glass is exposed to the greatest stress. Each design of our hand engraved crystal glasses has its own story. 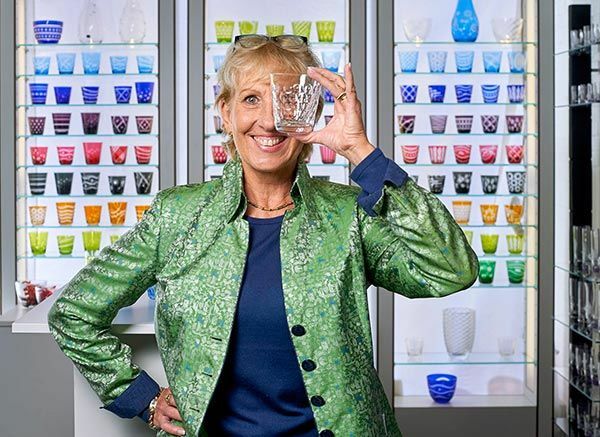 Read design stories from Rotter Glas in Lübeck here. 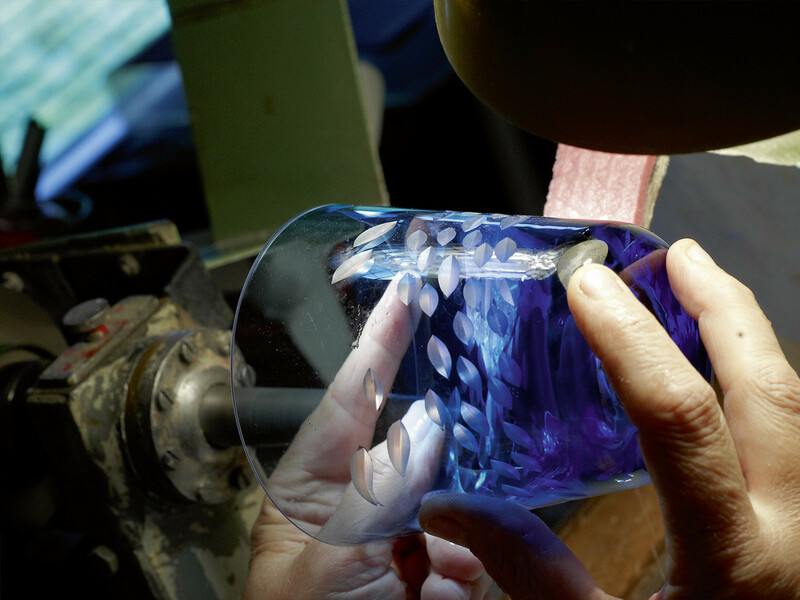 Our glass engravers at Rotter Glas Lübeck create masterpieces made of finest crystal glass. Here you can find out how. We foster young talents to ensure the continuation of the craftsmanship of Rotter Glas in Lübeck in the future. Our Trainees are exceptional. Take a look over our glascutter´s shoulder.